Picking Paint Colors… – Everything Your Mama Made & More! Well the sheet rock starts going up tomorrow… & in a week it should be finished, textured & ready to paint! SOOO that means I have to pick the paint color for my new sewing room! I have been thinking about it for a while… I have been IN LOVE with the colors in Paula Prass’s Flights of Fancy Summer Colorway… in particular the Par Avion print. And though I LOVE it, I think it was just a little more white then I was looking for & the coordinates are very bold… which I love for quilting fabrics, but I don’t know if I could handle them all in such a small room. So while waiting to hear back from an Etsy seller about a price for some fabric I decided to browse for some Alexander Henry fabric & stumbled upon this fabric that has a simular colorway but is perfect for a sewing room! 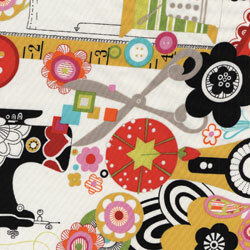 It is called ‘Sew Now, Sew Wow!’ and comes in black & white or multi colored. Apparently it is hard to get a hold because it took me a while to find some, but I finally found it for LESS then $12 a yard at Hancock’s of Paducah. I plan to use it for curtains, a message/tack board with ribbons & to make a chair cushion cover. Plus it gives me lots of accent colors to work with! Instead of spilling the beans I will tell you that the wall color is on this fabric 🙂 but you will have to wait until next week to see just which one it is! In the process I also found another great sewing themed fabric that I am going to have to buy at some point… ‘Home Sewing is Easy‘ comic strip fabric. I think I love it because it combines my love of sewing with B’s love of comic books. If we had to share an office I would totally have used it to decorate! Oh, I hope its the turquoise! 🙂 I am planning on painting my sewing room turquoise (a light and a dark) left over from painting our kitchen those colors. They are so light and airy and inspiring!